Figure 1. This group of 300 green-blue diamonds (1.97 carats total) was screened by GIA’s Tokyo laboratory. Among these, 299 were irradiated natural melee diamonds and the one on the right was an irradiated CVD synthetic melee diamond. Photo by Shunsuke Nagai. Mixing of synthetic melee diamonds with natural melee diamonds has been reported several times. Those examples were colorless (Winter 2016 Lab Notes, pp. 416–417; Summer 2017 Lab Notes, pp. 236–237) and yellow (Winter 2014 Lab Notes, pp. 293–294). Recently, GIA’s Tokyo lab found a single irradiated green-blue CVD synthetic melee diamond in a parcel of similarly colored irradiated natural melee. The parcel of 300 uniformly green-blue round melee was submitted for identification (figure 1). 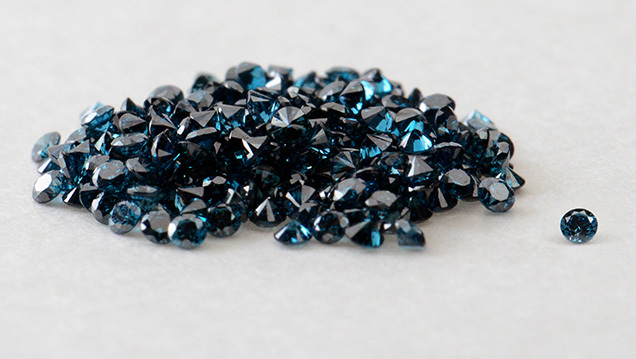 Each diamond’s color was attributed to strong GR1 by irradiation treatment. Infrared absorption spectroscopy, photoluminescence spectroscopy, and DiamondView analysis confirmed that 299 of them were irradiated natural diamonds and one of them was an irradiated CVD synthetic diamond. The CVD synthetic diamond weighed 0.007 ct, with a diameter of 1.14 mm. Figure 2. DiamondView imaging revealing weak linear striations in the pavilion of the irradiated CVD synthetic melee diamond. Figure 3. The photoluminescence spectrum of the green-blue CVD synthetic melee diamond at liquid nitrogen temperature shows a strong GR1 peak. The SiV– center defect can be observed at around 736 nm. The doublet at 596/597 nm indicates that this diamond did not undergo annealing after synthesis. DiamondView images of the synthetic showed very weak linear striations in the pavilion (figure 2). Dark inclusions were observed under the microscope. The infrared spectrum showed a peak at 3123 cm–1, and the photoluminescence spectrum showed doublet peaks at 596/597 nm (figure 3). These peaks are seen in CVD synthetic diamonds without post-annealing. The photoluminescence spectrum also showed a small, broad SiV– center defect at 737 nm next to a very strong GR1 center at 741 nm (figure 3). 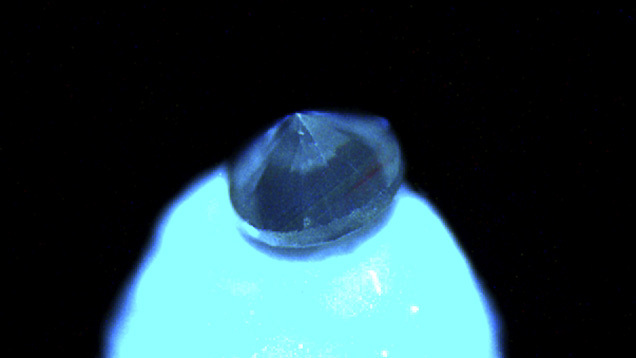 From the peak at 3123 cm–1 and the 596/597 nm doublet peak, this diamond was concluded to be irradiated without pre-annealing. Irradiated CVD synthetic diamonds are rarely seen at GIA, which had examined only six of them before this report (Fall 2014 Lab Notes, pp. 240–241; Fall 2015 Lab Notes, pp. 320–321; Summer 2018 Lab Notes, pp. 215–216). Previously reported irradiated CVD synthetic diamonds were relatively large, from 0.43 to 1.34 ct. This is the first melee-sized irradiated CVD synthetic diamond examined by GIA. Shoko Odake is a research scientist at GIA in Tokyo. Screening reveals a surprise within a batch of synthetic diamond melee. GIA Melee Analysis Service reports a significant number of CVD synthetic diamonds in a parcel. While laboratory-irradiated diamonds are often submitted for grading reports, irradiated synthetics with a green-to-blue color are still a rare occurrence.